AUSTIN, TX--(Marketwire - October 20, 2010) - SolarWinds® (NYSE: SWI), a leading provider of powerful and affordable IT management solutions to more than 95,000 customers worldwide, today announced the commencement of the Common Criteria evaluation process for its Orion® family of management products and that the company has named a new head of federal and public sector sales. 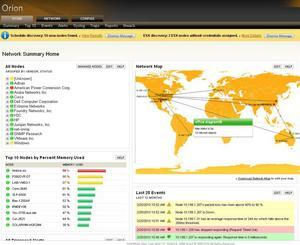 SolarWinds' products are used by virtually every civilian agency and department of the Federal government including: Department of Homeland Security, Federal Aviation Administration (FAA), Department of Veterans Affairs (VA), all branches of the U.S. Military, the Office of the Secretary of Defense and the United States Department of Agriculture (USDA). SolarWinds is seeking certification for the Orion® family of network, application and server management products, which includes Orion Network Performance Monitor (NPM), Orion Network Configuration Manager (NCM), Orion Application Performance Manager (APM), as well as several modules. The company has chosen CygnaCom and its Security Evaluation Laboratory (SEL) to conduct the independent evaluation required to achieve Evaluation Assurance Level (EAL) 2 Common Criteria certification. "The federal IT community faces some of the toughest conditions when trying to deploy a secure IT infrastructure. We appreciate the high stakes and are dedicated to building products that help solve these challenges," said Sanjay Castelino, Vice President, product management and product marketing. "Receiving Common Criteria EAL 2 certification would be an important step in SolarWinds' commitment to the Federal market. It would give our customers independent, third-party assurance that our products can meet the highest standards and compliance requirements and can support the unique demands of civilian agencies and military installations alike." Common Criteria is an internationally recognized standard that provides a broad range of evaluation criteria for commercial and nationally sensitive government-use IT security products. CygnaCom's Common Criteria Testing Laboratory (CCTL) is accredited by the National Voluntary Laboratory Assessment Program (NVLAP) and approved by the NIAP. The CygnaCom SEL performs Common Criteria evaluations in accordance with the NIAP Common Criteria Evaluation and Validation Scheme (CCEVS).The certification process typically takes one year. For more product and U.S. General Services Administration (GSA) pricing information, visit SolarWinds' Solutions for Federal Environments page. To access the SolarWinds Orion listing for Common Criteria testing, please visit the CygnaCom website. SolarWinds has also named David Kimball, Vice President of Public Sector Sales. Kimball brings more than 20 years of Information Technology sales and senior management experience to SolarWinds, with more than 10 years of experience focused specifically on the federal government market. Prior to SolarWinds, Kimball was Managing Director of Federal Sales for Cenzic, a Web Application Security software company where he managed the worldwide federal sales efforts; expanding Cenzic's channels of distribution and establishing strategic relationships with key Federal Systems Integrators while driving new customer acquisitions including key Department of Defense (DOD), Intelligence and Civilian agencies. Prior to joining Cenzic, Kimball served as the Regional Vice President of Federal\Enterprise for SupportSoft (acquired by Consona), providers of Support Automation and Knowledge solutions. In addition to sales leadership positions with Intellitactics and NetIQ, Kimball was also responsible for designing and building a strong federal sales organization at Remedy Corporation. Kimball will be based in the Washington, D.C. area. "Our federal and public sector business continues to be an important priority for us. Given the unique circumstances involved in working with the various state and local, Civilian, Intelligence and DOD agencies, we felt that it was critical to add a strong, experienced sales leader to our SolarWinds' sales team," said Kevin Thompson, President and CEO, SolarWinds. "We believe that David Kimball has the right blend of technology, sales, and leadership experience needed to help guide our federal, state and local business." This press release may be deemed to contain "forward-looking" statements, which are subject to the safe harbor provisions of the Private Securities Litigation Reform Act of 1995, including SolarWinds' belief of the future success of its public sector sales. These forward-looking statements are based on management's beliefs and assumptions and on information currently available to management. Forward-looking statements include all statements that are not historical facts and may be identified by terms such as "continues," "believes" or similar expressions and the negatives of those terms. Forward-looking statements involve known and unknown risks, uncertainties and other factors that may cause actual results, performance or achievements to be materially different from any future results, performance or achievements expressed or implied by the forward-looking statements. Factors that could cause or contribute to such differences include, but are not limited to, SolarWinds' inability to capitalize of public sector opportunities under its new sales leadership and such other risks and uncertainties described more fully in documents filed with or furnished to the Securities and Exchange Commission, including its Form 10-Q for the second quarter of 2010 filed on July 30, 2010. All information provided in this release is as of the date hereof and SolarWinds undertakes no duty to update this information except as required by law. CygnaCom Solutions Inc., headquartered in McLean, VA and founded in 1994, specializes in Public-Key Infrastructure (PKI), Information Assurance and system security engineering. CygnaCom provides risk assessments, security architecture, identity/privilege management and security assurance consulting. CygnaCom operates security-testing laboratories accredited by NIST's National Voluntary Laboratory Accreditation Program (NVLAP) to conduct product evaluations and validations to US government standards for information assurance (Common Criteria), FIPS 140-2 and approved algorithms, PIV, and SCAP. CygnaCom Solutions is now a wholly owned subsidiary of Entrust, Inc., a global leader in information assurance and identity management products. Entrust is a US corporation, headquartered in Dallas, Texas. SolarWinds (NYSE: SWI) provides powerful and affordable IT management software to more than 95,000 customers worldwide -- from Fortune 500 enterprises to small businesses. We work to put our users first and remove the obstacles that have become "status quo" in traditional enterprise software. SolarWinds products are downloadable, easy to use and maintain, and provide the power, scale, and flexibility needed to address users' management priorities. Our online user community, thwack, is a gathering-place where tens of thousands of IT pros solve problems, share technology, and participate in product development for all of SolarWinds' products. Learn more today at http://www.solarwinds.com.